1 HCCAA Board Manual All Sections w-Revised Bylaws 2-6-18 – Hill Country Community Action Assn. This entry was posted on April 5, 2018 by hccacomuser. 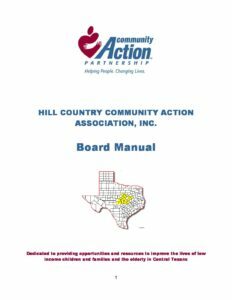 Hill Country Community Action is dedicated to providing opportunities and resources to improve the lives of low-income children and families and the elderly in Central Texas. Copyright © 2019 Hill Country Community Action Assn.. All Rights Reserved.